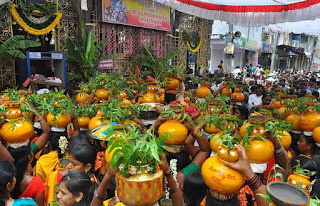 Thousands of devotees gathered at the Mahankali temples, the festival began with ‘Mahabishekam’. 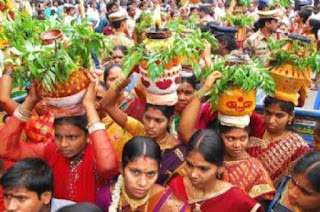 Then women offered ‘bonam’ containing cooked rice, jaggery and curd carried in steel and clay pots while ‘potharajus’ danced according to drumbeats in the front of the women’s who offering bonam. As the day progressed, the decibel levels of the festivity rose higher and higher with pulsating folk songs. The festival would conclude on Monday with the oracle prediction, ‘Rangam’ followed by a procession of a caparisoned elephant, carrying ‘ghatam’ of the Goddess Mahankali.